Electric openers have eliminated the need for opening and closing garage doors manually. They save time and effort, as well as increase the level of your home's security. However, if they are not properly maintained along with other metallic parts of your garage door, they may end up posing certain safety risks to you and your family members. You have to test your opener's safety reversal mechanism regularly, i.e. at least once in a month or two. All you have to do is to place a paper tower roll under the door and push the button for closing it. If the door reverses upon touching the roll, then the mechanism is working fine. If not, there is an issue, and you should seek professional assistance right away. In general, you need to make sure your opener's sensors are also working properly. This test involves carefully cleaning the photo eyes with a soft lint-free cloth and making sure they are able to detect an obstacle. Place an object in front of them and order your door to close. If your door refuses to close, or starts closing and immediately reverses, then the sensors are working fine. Once again, if your system fails this test, contact our experts right away. You need to run some tests on your springs as well. This is because a broken garage door spring can make the whole door collapse on a car or on a person, not to mention damage anyone standing nearby when the spring snaps. You should inspect the spring visually for signs of rust, deformation and other types of wear and tear damage. You can disconnect the door from the opener and lift it manually. If it is too heavy to lift, spring replacement may be required. You should also lift the door half way through and let it stay that way. If it moves in either direction, the spring's tension will have to be adjusted. The best way to prevent accidents from happening is by making sure your system undergoes professional maintenance on a regular basis. 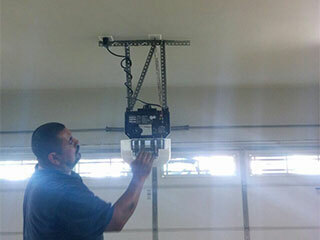 Be sure to contact our experts at Garage Door Repair Miami today to schedule an appointment.